Product news: Hackney designer Ed Carpenter has created a countryside version of his London design classic, the Pigeon Light, this time shaped like a pheasant. Made of vacuum-formed acrylic, the Pheasant Light for design brand Theo can be clipped on to surfaces with a peg where the bird's feet would be. The light is currently available in white but more colours may be released in the new year. 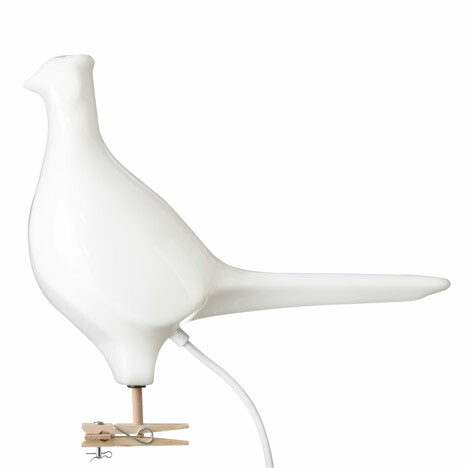 Ed Carpenter first designed the Pigeon Light (above) for his Royal College of Art graduation project in 2001. He collaborated with Theo founder Thorsten van Elten to produce the light, which has become an iconic urban souvenir and is a best-seller in museums and design shops worldwide.